Our latest round-up from the top divisions of the Sussex Cricket League features wins for Middleton, Pagham, Bognor and West Wittering - but there was not such good fortune for Chichester and Stirlands. Middleton chalked up a fantastic win over league leaders Brighton & Hove at Sea Lane. Captain Sean Heather, on winning the toss, elected to bat first and opener Matt Reynolds shared partnerships of 38 with Josh Wood, 85 with Mahesh Rawat and 42 with Patrick Colvin. Reynolds was out for 60, bowled by Brighton captain Simon Hetherton, who took five wickets. It was Reynolds’ first 50 for the club. Rawat (53) and Colvin (60) were the other main scorers in a Middleton innings that closed on 230-8. Sussex opener Luke Wells opened the Brighton innings but was the first to go, caught at slip by Heather off the bowling of Charlie Terry. Two partnerships, one of 73 between Bryce Hounsome and Issac Taylor and another of 74 between former Sussex player Matt Machen and skipper Hetherton, saw Brighton reach 163-3. But it all went wrong for them and following the removal of Hetherton, stumped by Rawat off the bowling of Craig Fowle, Brighton lost their remaining six wickets for just 43 runs, ending 206 all out. Fowle (4-69) and Josh Wood (4-20) were the main wicket takers, with Heather taking five catches, four in the slips, including the all-important wicket of Machan at deep mid-on as he was eighth out for 77. Bognor built on the previous week’s win against Chichester when they went to Ansty. Fielding first on a blustery day, Bognor chipped away at Ansty with two wickets apiece for jolly Jamaican Marquino Mindley, Joel Baker, Josh Sargeant and Scotty Bingham. For Ansty, Harry Towler top-scored with 92 not out in a total of 192-8. The reply from Bognor was led by skipper Ryan Maskell – the man known at the ‘Ginger Bradman’ played with power and panache to score a sublime 126 not out and lead his troops home with a four-wicket win. Rain the previous evening convinced home captain Matt Geffen to insert the visitors after winning the toss. The hosts started well, reducing Mayfield to 7-2. Rob Sharma (50) was joined by Harry Lloyd and the pair moved the game away from Chichester. When Sharma fell after reaching his half century Lloyd continued almost unchallenged. The hosts managed to pick off Lloyd’s partners but Mayfield still reached 200-7. Mayfield declared, despite Lloyd being on 98 not out. In response Chichester’s top order again struggled. Only Will Futcher (60) achieved a score of note. Three Mayfield bowlers took three wickets between them, the best of them was James Allen (3-25). 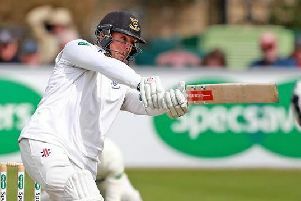 Chichester were bowled out for 136, condemning the side to a second defeat in a row. Chichester remain sixth on 195 points but are now just 29 points above the relegation zone and find themselves in danger of getting dragged into a fight to stay up. They go to third-placed Haywards Heath on Saturday. On a blustery Saturday Stirlands had to be content with a draw after Steyning’s tail-enders played out the final few overs. Stirlands’ stand-in captain Will Gubbins won the toss and chose to bat first. Gubbins opened with Adam Downing and punished any wayward bowling by Steyning’s youthful new ball attack of Chris Barnett and Chris Etherington, while Downing played a watchful innings. Steyning captain Luke Chapman turned to the experience of Andy Isaacs with immediate reward; trapping Downing lbw for 22 to break the opening stand of 89. Young George Briance’s bad run of form continued as a seaming delivery from Isaac Tidley snuck through his defence. Debutant Greg Smith joined Gubbins and the pair began to punish anything loose. Smith upped his scoring rate, bringing up his 50 in 67 deliveries, while Gubbins brought up his second century of the season off 134 deliveries. Smith raced to 90 but in the final over, while attempting a second run, he was run out for 92 having put on 149 at a run a ball with his captain. Stirlands declared after 53 overs on 250 for four. Steyning began their chase well as Barnett and Tidley took a positive approach to the bowling of Jamaine Bullen and Dan Mugford; their opening stand reaching 50 in 12 overs. George and David Briance were introduced to slow Steyning’s scoring rate and George Briance was rewarded with the wicket of Tidley, caught by Smith for 27. Oliver Collins was dismissed by David Briance. Barnett was next to depart, giving under-16 Felix Harvey his maiden first-XI wicket, having moved the score onto 123-3 when he was caught by Gubbins for 65. Steyning’s hopes rested with Thomas Chalmers and Johnny Burfiend, but Stirlands kept applying pressure and the younger Briance eventually had Burfiend stumped by Gubbins. Bullen returned and excellent rotation of the bowlers by Gubbins reduced Steyning to 226-8 entering the final over, where only one additional run was scored as Steyning went into an ultra-defensive mode to secure a draw. This week, Stirlands go to Findon for the final timed fixture of the season. On a surprisingly green wicket, Findon elected to bat and soon regretted the decision as Rico Webb dismantled the top order, taking the first four wickets with only 12 on the board. When Justin Scott removed Bradley Bridson for 17 Findon were 25-5. Thanks to Curtis Howlee (43) and Liam Freeman (35), the home side recovered to some degree and ended 138 all out after 39 overs. Gareth Davies followed up his five-wicket haul against West Chiltington with 5-28. In reply Pagham had few scares in knocking off the required runs and ran out comfortable winners by six wickets. Ryan Barratt ended 39 not out. Only Mathew Wratting (3-24) made any inroads into the Pagham top order. Although it was a good win for Pagham it was slightly overshadowed by some rather petulant behaviour which resulted in five penalty runs awarded to FIndon and four points deducted from Pagham. West Wittering are well-positioned in the promotion race after a win at Steyning. The day began with Carl Tupper winning the toss and electing to bat first. Three of the top five failed to contribute. Runs were hard to come by and the Steyning openers restricted the visitors to 43-3. However, Mark Taylor remained resolute, and the arrival of in-form Brandon Trimmer marked the start of a change in fortunes. The pair put on an invaluable 71 and Wittering were right back in it. Both Taylor (29) and Trimmer (57) fell within a few balls of each other, but one of the performances of the day by Liam Bates (37*) turned the tide back in Wittering’s favour. A few cameos at the end of the innings took them to 200-9. Wittering got to work at dismantling the Steyning line-up. Tupper and Joe Pink started strongly, restricting scoring opportunities and picking up important early wickets. With Steyning 38-3, Wittering felt right on top. Despite contributions from Kennett (18) and Buckley (38), an excellent spell of bowling from man of the match Kieran Baker (2-28) ensured Wittering remained in control. Steyning did not give up without a fight. A true captain’s innings from George Isaacs (50*) kept them in contention up to the last few overs. However, Pink and Tupper closed out the game with authority and Wittering stay in place to take advantage of any slip by Chipps.